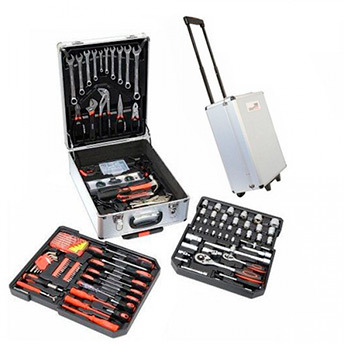 PWR WORK ® 186 Hand tools kit with trolley case is an easy way to transport 186 useful tools. Its metal trolley will keep your tools safe. The PWR Work tool kit on wheels has a double security lock and measures approx. 47 x 36 x 22 cm altogether. It’s really surprising how so many different tools fit in so little space! In addition, the tool kit has a convenient extendable handle with wheels, so this 14 kg tool box will feel as light as a feather.